but Israel doesn’t know its master. My people don’t recognize my care for them.” God wants His children back. The children He created and formed and breathed life into them. The apple of His eyes. He’s not happy with the offerings and dancing and worshiping in the open. Then in the close, fornication and lust and idol to money and treating people badly. Yes He hasn’t said we shouldn’t worship or dance or pray. But He is saying the worship should be a result of being set free. The worship should be thanking Him for opening your eyes from what could have destroyed you. Wash yourselves and make yourselves clean; put away the evil of your doings from before my eyes. Cease to do evil. God sees everything man cannot see. He knows the beginning from the end. He doesn’t want us to live in brokenness and emptiness and be lost. He tells you to stay away from sin because it destroys you. 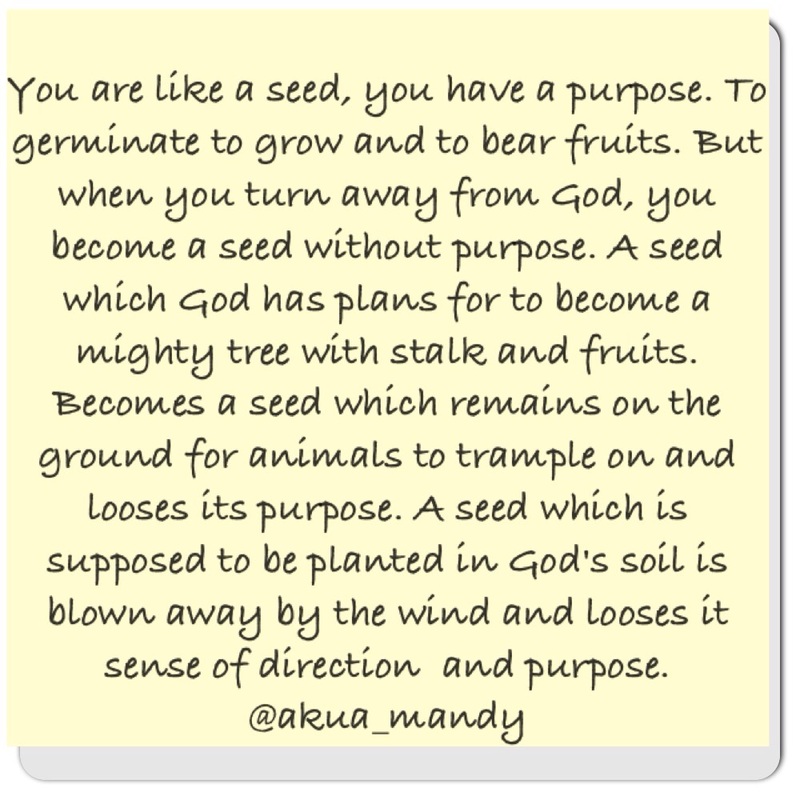 You are like a seed, you have a purpose. To germinate to grow and to bear fruits. But when you turn away from God, you become a seed without purpose. A seed which God has plans for to become a mighty tree with stalk and fruits. Becomes a seed which remains on the ground for animals to trample on and looses its purpose. A seed which is supposed to be planted in God’s soil is blown away by the wind and looses it sense of direction and purpose. But God is saying “Come as You are. It doesnt matter what sin you did last night or this morning or what you are planning to do tomorrow. God said Come as you are my Daughter. Even though you have walked away , you are still mine. I will take you back in , don’t worry about what you’ve done. I have plans for you, let’s start afresh. Its not too late my child. I know your thoughts afar off. I know everything about you.” Psalm 139:2 You know when I sit down or stand up. You know my thoughts even when I’m far away. “Come now, let’s settle this,” says the Lord. Though they are red like crimson, I will make them as white as wool. 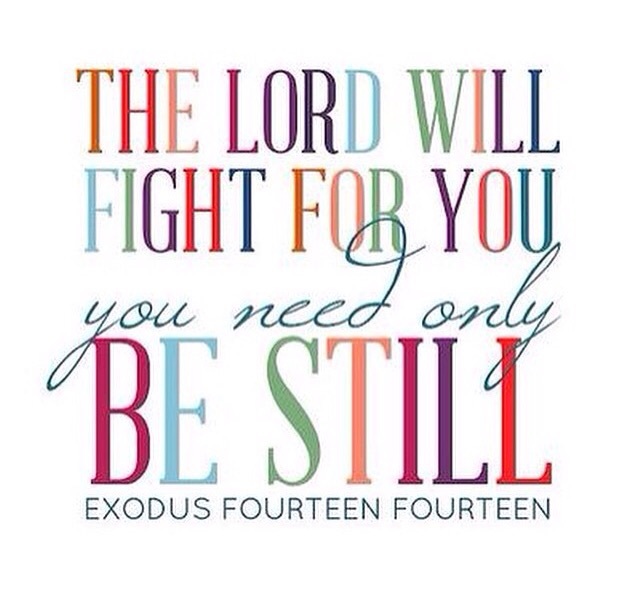 The Lord wants to settle things with you. He will walk beside you on your journey to obey Him. You don’t have to be afraid, even if you loose friends or family because of your obedience, His reward is greater. God himself will make you new, if you come and lay it all down to Him. It doesn’t matter what you’ve done, God knows everything already. But He still loves you and wants you back. But don’t continue to turn away and disobey God. 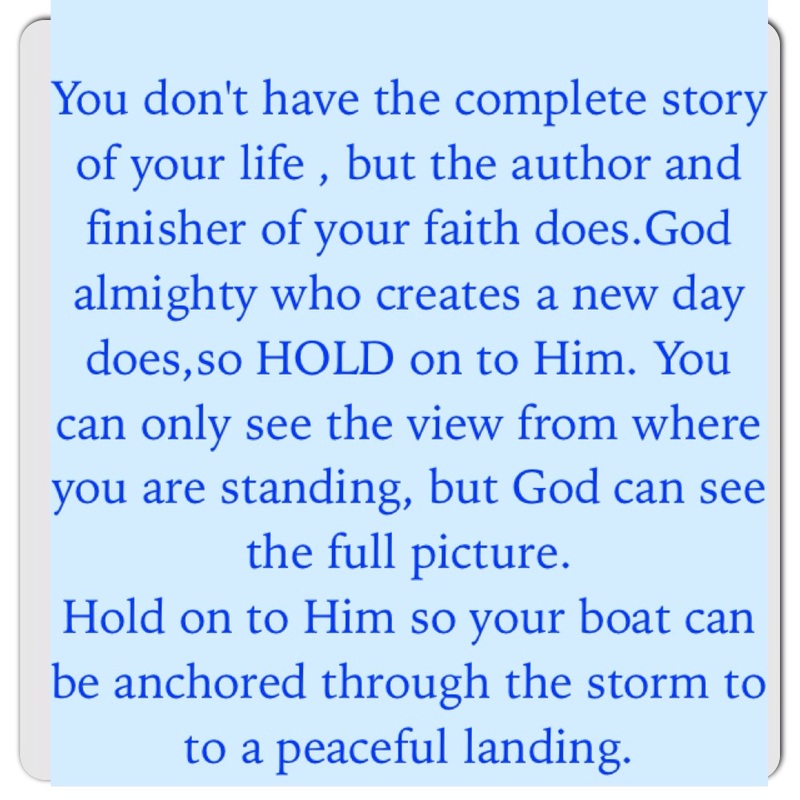 Come now and He will give you the strength. Come now and Jesus will cover you. Don’t keep walking in blindness to be destroyed without seeing what’s coming. Walk in the light, so you can see the path ahead, walk in the light so you are directed. Walk in the light so darkness does not overshadow you. John 1:7 But if we walk in the light, as he is in the light, we have fellowship with one another, and the blood of Jesus, his Son, purifies us from all sin. 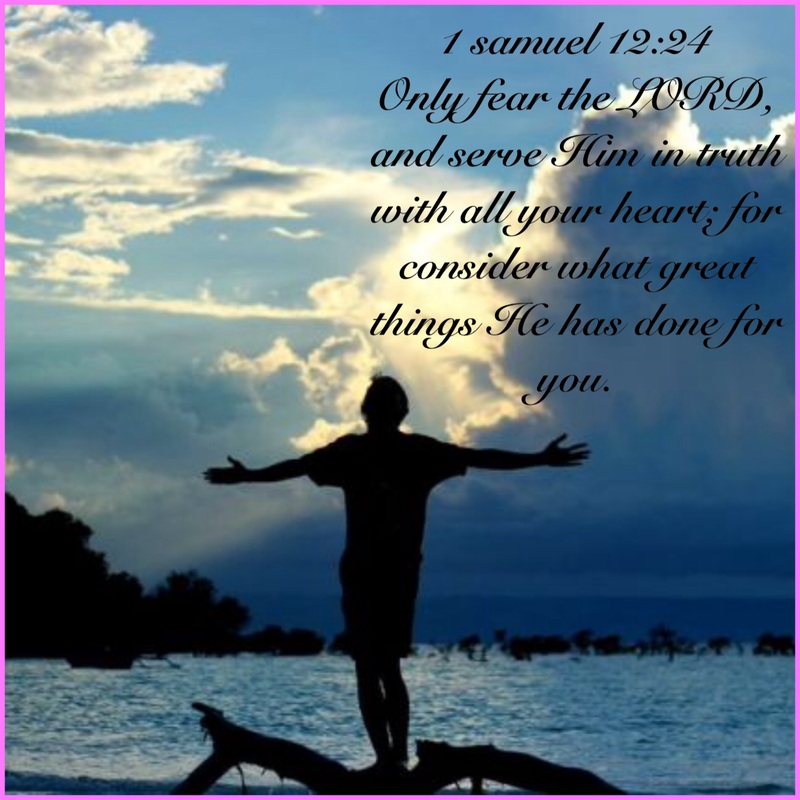 Fearing God and obeying Him. In the book of exodus chapter 1, the new king of egypt realised that the Israelites were multiplying and were more mightier than those of Egypt, He told the midwives to kill every first born son from the israelites. But the midwives did not do as the king said because they feared God. They had the fear of God in them.The fear of God in them was greater than the fear of human. Yes the king ruled over Egypt. But God rules over the world. And everything in existence is a result of God’s marvelous and mighty handy work. In society nowadays people are afraid of loosing friends if they choose to obey God. People are afraid of been rejected if they choose worshiping God over listening to music which does not glorify God. People are afraid of loosing the physical things if they choose to walk with God and talk about God. But everyone who denies me here on earth, I will also deny before my Father in heaven. How do we choose mere man over omnipotent God? 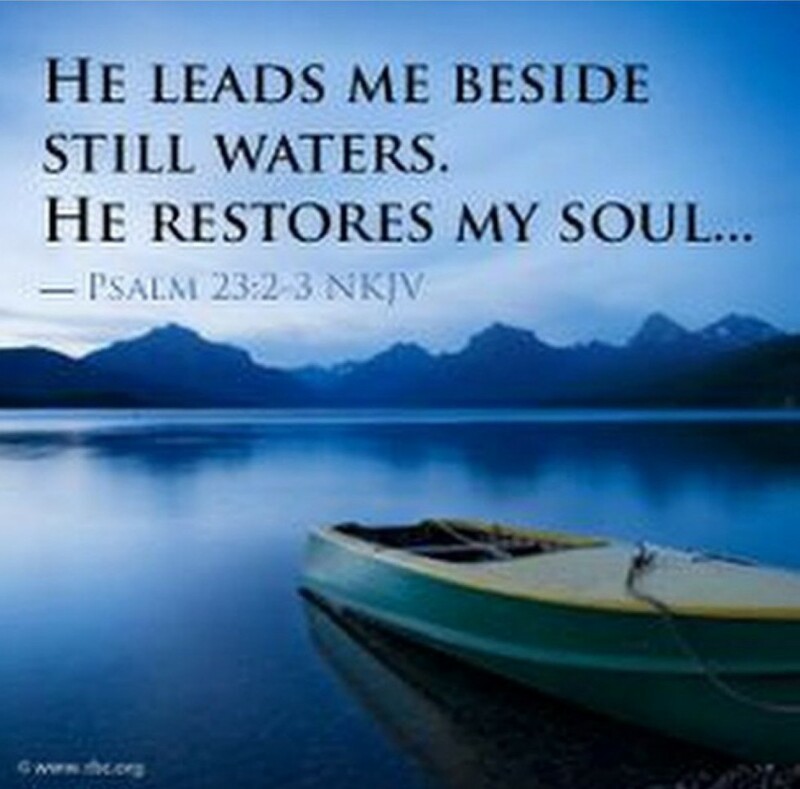 When our very breath is controlled by God. When He loves us soo much He created us in His image? When He gave His only son Jesus to die for our sins? God is all powerful and will protect you. God is omnipresent and will never leave you. God is our provider and you shall never lack. God does not just want the best for us. But He will also reward us for our obedience and commitment to Him. Yes sometimes it may seem like straight after you made a choice to walk with God, certain friends leave, you feel rejected and alone. But you are never alone. You are been built to depend on God. 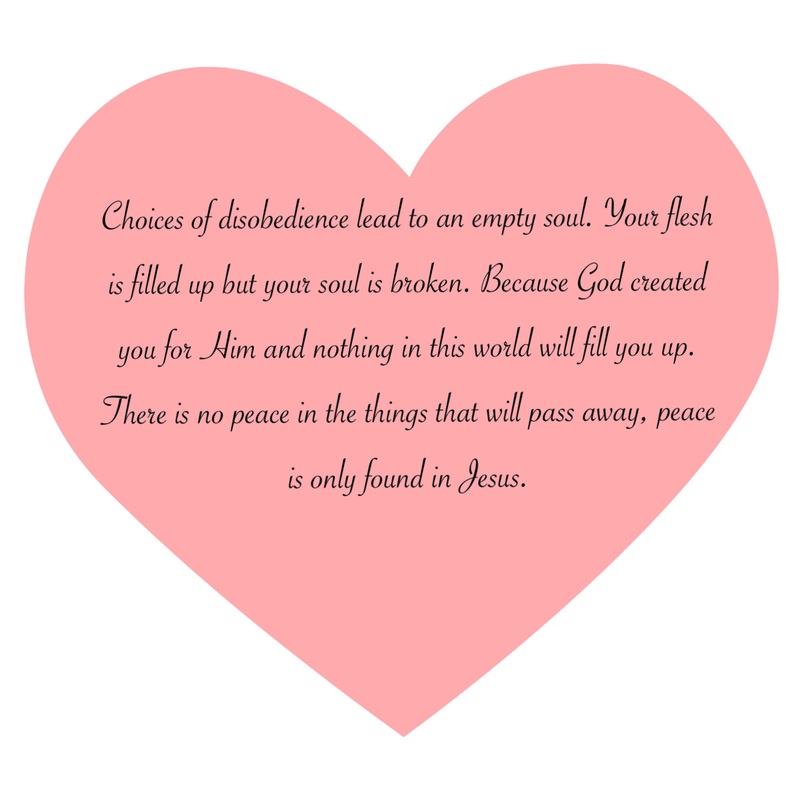 And you will be filled with peace which will not depend on how many friends you have or when someone walks out of your life.You will be directed atand can exercise your God given authority. God loves us soo much. Before creating Adam,He made sure there was food,there was water, there was light, there was sun.He got everything ready so Adam would not have to wonder how to get things. Same with us, before He created us He already has a well laid plan out for us. That’s why He wants us to walk with Him and obey Him, so we are not destroyed, so we are not broken,so we are not lost, so we spend eternity with Him. So God dealt well with the midwives when they obeyed God over the king of Egypt. The bible says In Exodus 1:21 and it was because, the midwives feared God,that He provided Households for them. God will deal well with us when we obey Him. When we fear Him more than man. When we come to understand that because He has all power in His hand and has the best install for us. When we come to understand that the intention behind why We should obey Him is because He loves us and has great plans for us. He will not let us be put to shame. 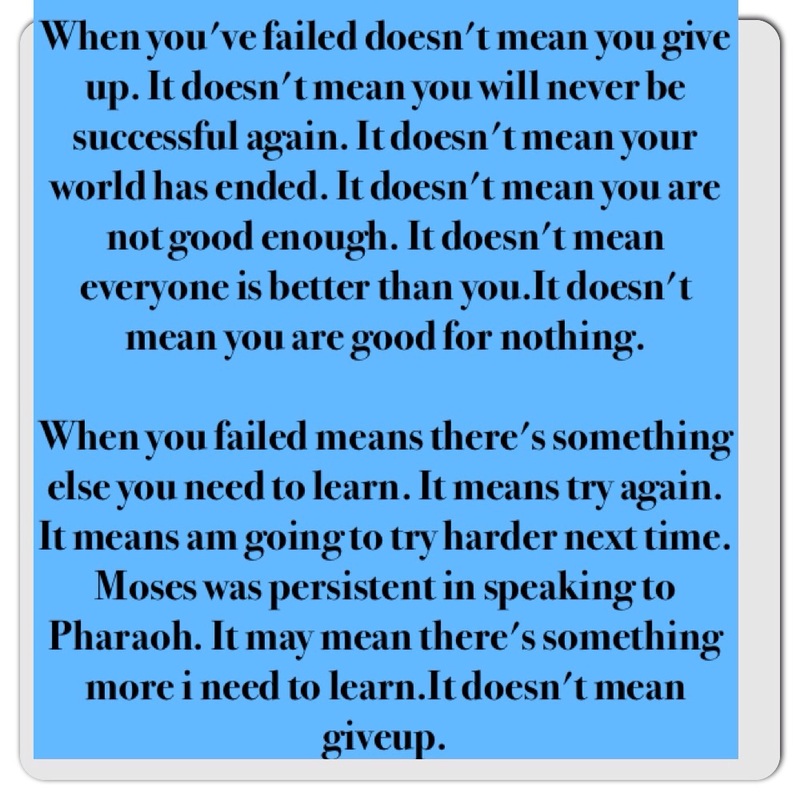 They say nothing good comes easy in life. But God has already done the difficult part we could not do. All our sins Jesus carried to the cross and died for us, so we don’t carry that burden and suffer in Hell. And we have the holy spirit living in us to lead and guide us into all truth.We’ve been given authority in Jesus name to trample over all the power of the enemy and nothing shall by no means harm us. Its always easy to walk on a broad road, where you can switch from one lane to the other. Where you get lost with the crowd. Where you follow a multitude of people and are lead by their own ways. 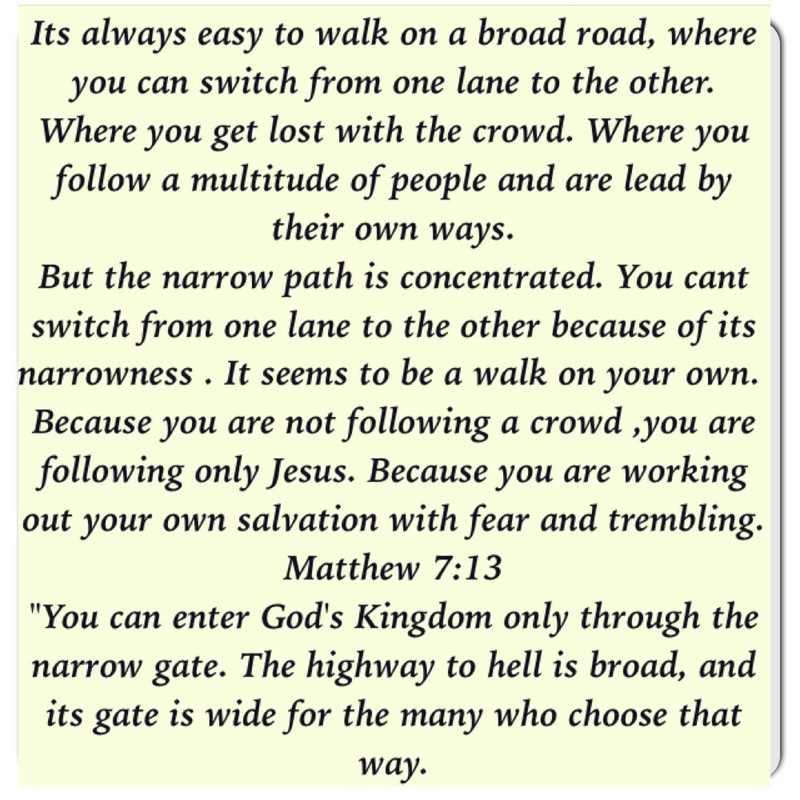 But the narrow path is concentrated. You cant switch from one lane to the other because of its narrowness . It seems to be a walk on your own. Because you are not following a crowd ,you are following only Jesus. 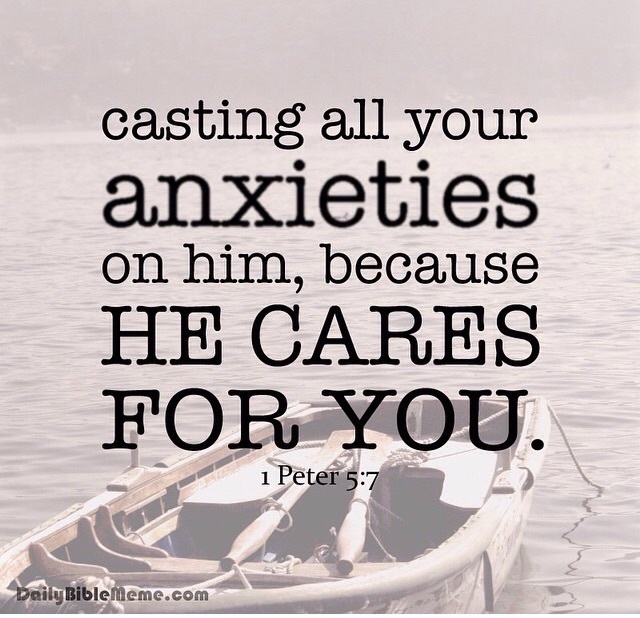 Because you are working out your own salvation with fear and trembling. Obedience to God does not just reward us here on earth as the midwives were rewarded, but there is also a reward in heaven and spending eternity with our Father in heaven. Why should we suffer here on earth and continue to suffer after we die. When we have the choice to walk and be led by God here on earth and spend eternity with Him.